This company probably needs no introduction. Founded by Tony DeMarzo and Tyson Miller in 2001, Progressive Technology has been constructing and supporting computer networks, websites and office communications systems around Hilton Head Island and Bluffton for almost a decade. If you’re in business and you use computers (duh! ), chances are you’ve met these guys. But what they’ve been doing lately to help build our community is new and something you’ll want to know about if you are involved in non-profit or charity work. Patrick was speaking of improvements to the school’s IT systems that Progressive provided at no charge as part of their CharITy Outreach Program. 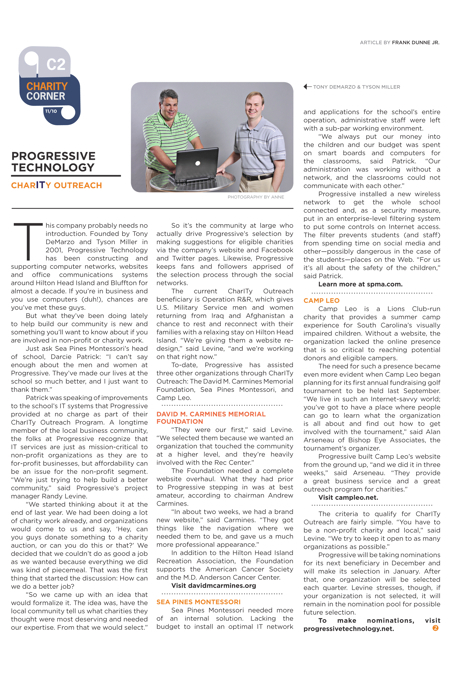 A longtime member of the local business community, the folks at Progressive recognize that IT services are just as mission-critical to non-profit organizations as they are to for-profit businesses, but affordability can be an issue for the non-profit segment. “We’re just trying to help build a better community,” said Progressive’s project manager Randy Levine. “We started thinking about it at the end of last year. We had been doing a lot of charity work already, and organizations would come to us and say, ‘Hey, can you guys donate something to a charity auction, or can you do this or that?’ We decided that we couldn’t do as good a job as we wanted because everything we did was kind of piecemeal. That was the first thing that started the discussion: How can we do a better job? So it’s the community at large who actually drive Progressive’s selection by making suggestions for eligible charities via the company’s website and Facebook and Twitter pages. Likewise, Progressive keeps fans and followers apprised of the selection process through the social networks. To-date, Progressive has assisted three other organizations through CharITy Outreach: The David M. Carmines Memorial Foundation, Sea Pines Montessori, and Camp Leo. The Foundation needed a complete website overhaul. What they had prior to Progressive stepping in was at best amateur, according to chairman Andrew Carmines. In addition to the Hilton Head Island Recreation Association, the Foundation supports the American Cancer Society and the M.D. Anderson Cancer Center. Sea Pines Montessori needed more of an internal solution. Lacking the budget to install an optimal IT network and applications for the school’s entire operation, administrative staff were left with a sub-par working environment. Progressive installed a new wireless network to get the whole school connected and, as a security measure, put in an enterprise-level filtering system to put some controls on Internet access. The filter prevents students (and staff) from spending time on social media and other—possibly dangerous in the case of the students—places on the Web. “For us it’s all about the safety of the children,” said Patrick. Camp Leo is a Lions Club-run charity that provides a summer camp experience for South Carolina’s visually impaired children. Without a website, the organization lacked the online presence that is so critical to reaching potential donors and eligible campers. The need for such a presence became even more evident when Camp Leo began planning for its first annual fundraising golf tournament to be held last September. “We live in such an Internet-savvy world; you’ve got to have a place where people can go to learn what the organization is all about and find out how to get involved with the tournament,” said Alan Arseneau of Bishop Eye Associates, the tournament’s organizer. Progressive will be taking nominations for its next beneficiary in December and will make its selection in January. After that, one organization will be selected each quarter. Levine stresses, though, if your organization is not selected, it will remain in the nomination pool for possible future selection. To make nominations, visit progressivetechnology.net.